Umbro have released a brand new video aimed at promoting the launch of the 2009 FA Umbro Fives tournament. Tottenham players Darren Bent and Michael Dawson are featured in the video, as both turn their hand to management, taking charge of a London side with their eyes firmly focussed on qualifying. 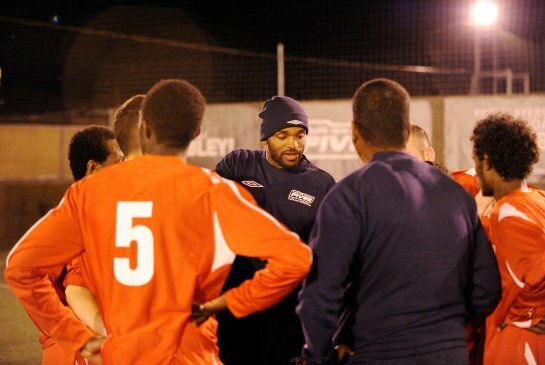 Filmed at the Goals Soccer Centre in Wembley, Bent and Dawson passed on a few tips to their respective charges who are hoping to go all the way to the finals of the tournament at Wembley. The 2009 FA Umbro Fives tournament, which is now open for registration, is the nation’s most prestigious small sided football tournament aimed at finding the best five-a-side football team in the country. Now in its third year, teams will do battle up and down the country over the coming months intent on achieving one goal – a place in The FA Umbro Fives Finals at the home of English football – Wembley Stadium on the 20th June 2009. The tournament, which is already underway, is open to both men’s and women’s teams of any ability that are over 18 years of age. Team’s can sign up to enter the qualifying heats online by simply logging on to the official site. Each team that progresses to the final will be treated to the ultimate Wembley experience. As well as travelling on the England bus, they will get access to the main player changing rooms, walk out of the Wembley tunnel and sing the national anthem on the pitch with the other finalists. The overall winners of the tournament will climb the famous Wembley steps to receive their trophy. For your chance to put you and your team mates on the road to Wembley glory, simply enter your team and find out about your local heats by logging on to www.TheFA.com/UmbroFives. did nike not buy over umbro?